No Uppers, Bad Lowers...Teeth, That Is! 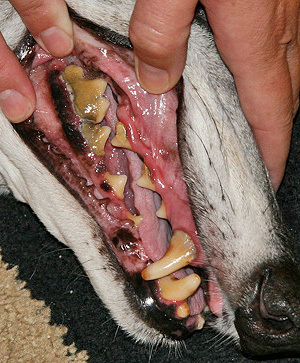 Normally the first teeth that have to be extracted in a greyhound's mouth will be the upper molars and premolars. If you look at the diagram below, those teeth are numbered 106, 107, 108, 109, 110, 206, 207, 208, 209,and 210. Quite often, 110 and 210 need to be pulled out long before the others. They'll get loose and will irritate your dog's mouth but you don't see them because they are so far back. If you are the type of person who is actually interested in your dog's mouth you need only lift the upper lip all the way to the back corner and look at 110 and 210, but you will most likely need a flashlight - a small one preferably! In a true snowball effect, if 110 and 210 are in bad shape and not pulled early on, it won't be long until 109 and 209 need to be pulled, and so and so on and so forth. Once you finally get around to having your dog's teeth pulled, we may be starting at 106 and 206 and taking them all out! Sometimes the 6's and 7's will remain while the others go, depending on how long you wait. Unfortunately, now you have a dog that has lower teeth that are stable and looking good but will no longer get the cleaning action from the teeth above when it chews. In true form, the lower molars will begin to build up substantial tarter and plaque and then they will have to be pulled, as well. You can avoid this scenario by using either a toothbrush or a gauze pad to rub those areas down on a daily or very frequent basis. It will take the muck away and then you won't have the substantial build-up which is seen in the photo below. As you can see in the photos, the upper canines will still build up plaque and tarter and also on the lower canines to some degree. This is an impactible problem that does not need to be a problem unless you choose to do nothing! And if you do nothing, they will become part of our collection!